I can’t remember the circumstance, but whilst looking around the web I stumbled across a control called ‘panelGrid’ that is available in standard JSF. I really liked the idea of it so I decided, why can’t we have it in XPages? we can! What does panelGrid control do? 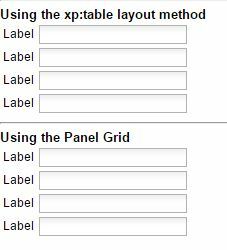 Basically the panelGrid renders an HTML table, but does so using minimal markup on your xpage. It does this by following a convention. The panelGrid has a ‘columns’ property which specifies how many columns the ‘grid’ should have. As each child component is found, it is rendered in a <td>, when it reaches the number of columns, it will start a new <tr> and carry on. So basically, it will render children left-to-right top-to-bottom in a grid layout using a <table><tr><td> pattern. using <xp:table> style, defining tr’s and td’s as necessary. As you can see visually it is the same result. As you can see, the panelGrid is a much cleaner design on the xpage. The control also has a header and footer facet, which is rendered as a colspanned td at the top and bottom of the table. The control is styleable and themeable. If you need to put more than one control in a ‘grid cell’ you can nest them under a span or div. Here is a 4 minute demo video to see the features in action. It is not for every situation, if you have a complex layout that you want to merge some cells, then the panelGrid might not be a good fit. But if you need a simple grid based layout that looks nice a clean on your xpage markup then give this a go! You will soon learn when it is appropriate. It wasn’t too hard to create for Xpages, the necessary renderer com.sun.faces.renderkit.html_basic.GridRenderer is already part of the XPages runtime as part of the core JSF that has been extended. It just hasn’t been surfaced for a component. I have started my own ‘extension library’ where I will be putting all the controls that I develop on this blog ( I plan to move emailvalidator there and also finish the phone number control!). You will need to enable the com.gregorbyte.xsp.library for your NSF in the xsp.properties editor. That should do it’ you may need to clean and build a couple of times. Good luck, Please let me know if you have any questions / problems! Next story Happy New Year / Blog / Domain!